Touch response isn't up to the mark; Sluggish user interface; Mediocre sound quality. 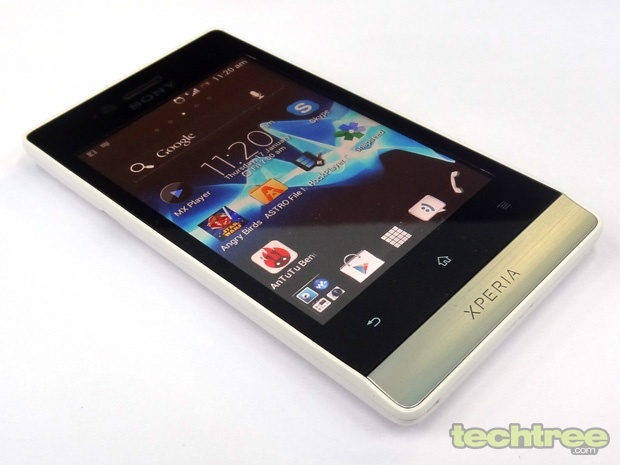 The Xperia miro seems to be Sony's shot at the budget Android smart phones. It is not as inexpensive as some of the other handsets touting comparable specs, but Sony's offering comes with a design and build quality that is usually associated with costlier models. It is powered by an 800 MHz CPU, display is a 3.5" touchscreen with only 320x480 pixels, an aging Adreno 200 GPU... you get the picture. There's nothing special in terms of specs. The question now is, how much can the packaging deliver? While the Xperia tipo dual managed to impress us with its price-to-performance ratio, has Sony compromised too much with the miro and banking heavily on the appeal of the exterior and the Sony brand weight? You can be forgiven for thinking it's impossible to get a well-build phone in the budget Android segment - after all, most of the budget models out there have sub-par build. The miro is an exception, fortunately. This phone borrows some design elements from its younger sibling, tipo, and manages to make it better by shedding some of its thickness. The iconic chin design makes the handset look trendy. Overall, the miro sports a clean look without being drab. The phone's matte finish and curved back provide good grip. One issue is the lack of backlighting for the three capacitive navigation keys, because of which, it's hard to hit the right keys in the dark. To notify users of events such as missed calls and received messages, the phone features a small status LED near the front-facing camera. There's also an LED strip below the Home button that does the same thing. The miro's 3.5" LCD screen is protected by a scratch-resistant glass (not Gorilla's though) . With pixel dimensions of 320x480, the handset offers pixels density of around 165 ppi. In comparison, the less-expensive Lumia 610 has a pixel density of 252 ppi. Due to the low-pixel density, the miro's screen sharpness isn't anything worth writing home about. The contrast ratio and brightness are decent, but the sunlight legibility is still disappointing. The Xperia miro's ships only with the charger and USB cable. Forget a complimentary memory card; it doesn't even come with a pair of earphones! The phone is powered by a Qualcomm MSM7225 chipset, clocked at 800 MHz. It comes with 512 MB of RAM, a 5 mp autofocus camera with LED flash, 4 GB internal storage, Wi-Fi, Bluetooth 2.1, A-GPS, FM radio, and 1500 mAh battery. The detailed spec list is towards the end of this review. Similar to the tipo dual and HTC's Desire C, this phone offers Android 4.0 (ICS) out of the box. At first glance, the UI seems smooth while swiping across homescreens. Going deeper, there's a significant amount of delay, even when performing simple tasks like browsing the phonebook or scrolling through messages. This isn't surprising, since Qualcomm's MSM7225A sports the Cortex-A5 CPU (not fast by any standards today) and coupled with the Adreno 200 GPU (which again is generations behind). For a phone that costs around 13k, Sony should have used faster computing hardware. If the lag wasn't enough to spoil the user experience, the screen's unpredictable touch response only makes matters worse. For instance, just to bring up the dialler, you have to click the phone icon 4-5 times. To make sure this problem wasn't limited to this particular review unit; I checked a couple of retail units, and found them all to be plagued with this same issue. So it's safe to assume that the Japanese manufacturer has used low-quality digitiser screen for this handset. Coming to the subject of essentials, the default browser does well most of the time. It offers nice interface and decent page rendering speeds. However, occasional performance hiccups keep popping up. In terms of gaming, the phone can run popular games such as the Temple Run and Fruit Ninja, but the low frame-rates keep haunting you. 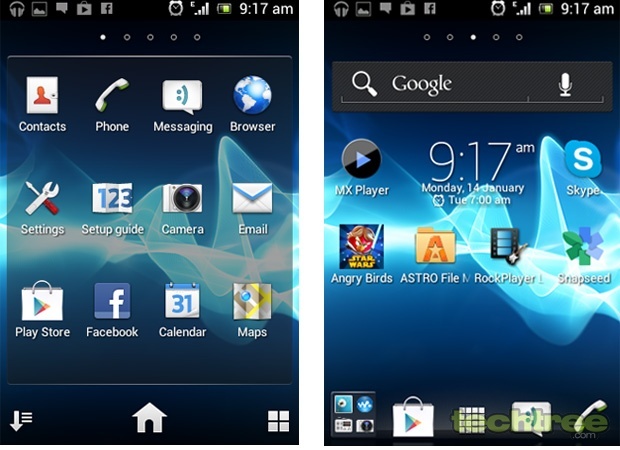 Overall, the Xperia miro's performance is disappointing. If you care about synthetic benchmarks, the handset scored 3900 in AnTuTu. Sony mostly does a good job when it comes to the sound quality. Unfortunately, the miro is a rare exception. It produces muffled sound: Equaliser and other sound settings do little to make it better. Similar to the Xperia tipo dual, the video player supports 480p MP4 and 3GP files out of the box. 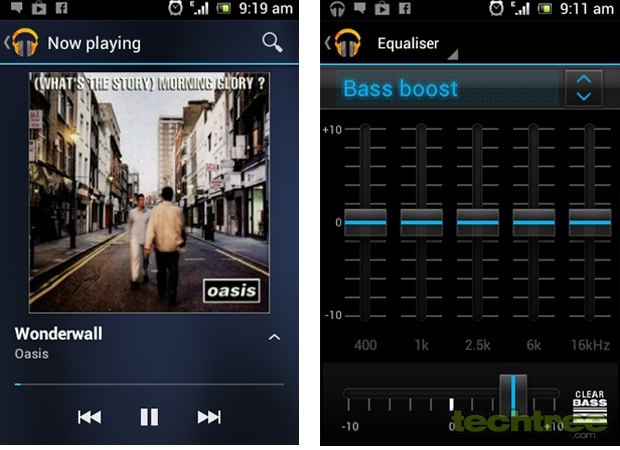 DivX and XviD files can be played using third-party apps such as RockPlayer. 720p videos through, are a no-go. The handset sports a 5 mp autofocus camera with a single LED flash. It does pack in some interesting features such as Sweep Panorama. 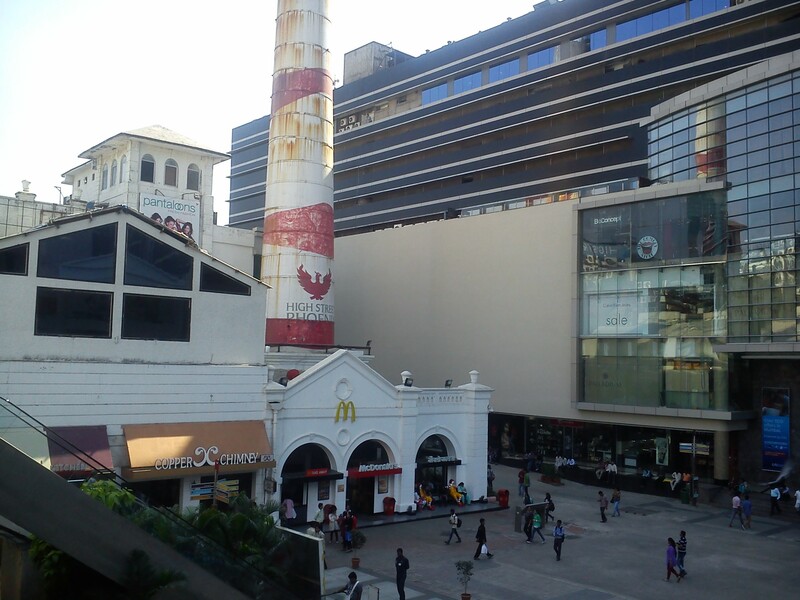 Going by the picture quality though, this is one of the worst 5 mp snapper I've ever come across. The resulting photographs contain unacceptable amount of noise even in well-lit conditions. The phone also tends to overexpose whites within the image. In short, if photography is something you frequently do with your phone, stay clear of this one. Click here, to check view the untouched sample. Similar to its still camera performance, there's nothing writing home about the miro's video recording. At max quality, it can capture 480p MP4 videos at 25 fps. Again, the level of detail is disappointing. During our testing, the handset's sound quality during the calls was loud and clear. There's was no issue with network reception either. On the messaging front though, there's a slight lag while typing. Moreover, Sony's implementation of auto-correction is very annoying. Therefore, I'd recommend disabling the "Spelling correction" option as soon as you get your hands on this device. 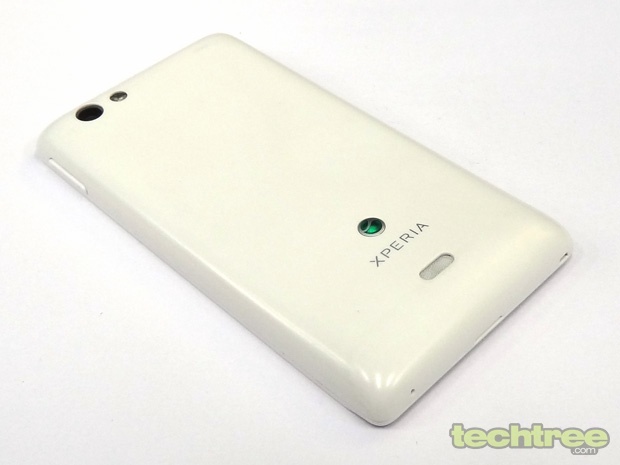 The Xperia miro ships with a 1500 mAh Li-Ion battery. In our video loop test with brightness set to 60%, it lasted a little over 5 hours. Compared to similarly priced Android, the battery performance is decent. The miro available for around Rs 13,000 via online stores. No doubt, it comes with a nice design and sturdy build. However, its lacklustre performance is a deal-breaker. Therefore, if you're looking to purchase a Sony handset at this price point, it's wise to spend a grand more and pick up the Xperia go. Not only does it offers a faster processor and better camera, but also comes with a water-resistant body. 800 MHz Qualcomm MSM7225chipset, 512 MB of RAM. 3.5" scratch-resistant multi-tocuh screen (320x480 pixels), anti-reflection coating, handwriting recognition. Internal storage 4 GB (2.2 GB user accessible), 32 GB microSD card slot. 5 mp auto focus camera with LED flash, 4x digital zoom; front VGA camera. Wi-Fi, Bluetooth 2.1, A-GPS.Micro-USB port, 3.5 mm jack, FM radio. 4.4" (l) x 2.3" (w) x 0.4" (10 mm) (d); weighs 110 grams.